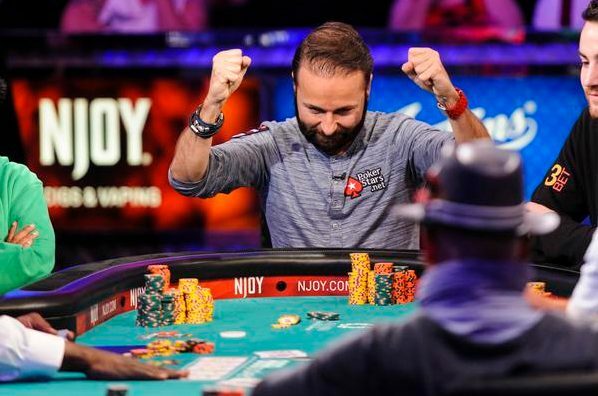 Daniel ‘Kid Poker’ Negreanu holds a healthy stack heading into day 6 of the WSOP Main Event. Just 69 players remain in the field. The PokerStars team pro holds over 3.6 million chips (nearly 100 big blinds), well above the average stack. That stack puts him 22nd in chips. End day 5 of WSOP main event with 3,620,000 70 players left avg is 2.75 million. This is fun. Another recent addition to PokerStars Team Pro roster – Aditya Agarwal – finished in 71st place for $96,445. 6,420 players began this years World Series of Poker Main Event. 2015’s World Champion will take down $7,680,021 and the bracelet. Negreanu’s highest WSOP ME finish was 11th place in 2001. Can he go deeper in 2015? He’ll have to outlast other big names including former Full Tilt red pro Brian ‘Stinger’ Hastings, 10th in chips with 4.74 million, and former November niner Matt Jarvis in 7th. In first place with over 7 million chips is Belgian pro Pierre Neuville. 2nd on the Belgium all time Belgium money list, Neuville goes by the monicker ‘the serial PokerStars qualifier‘, frequently satelliting into major land based tournaments on the world’s largest online poker site. 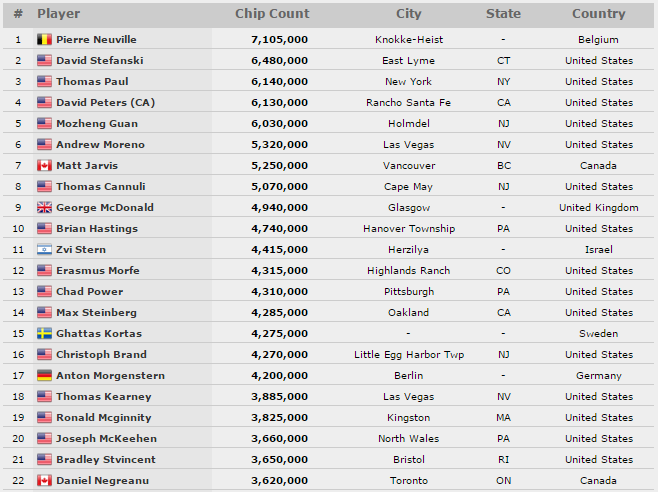 The last remaining female, US player Kelly Minkin, sits in 37th place with over 2 million in chips. Play continues tomorrow at 12pm PST and will continue for five more levels or until 18 players remain. Update – Negreanu finished 11th again, as in 2001. He takes down $526,778 for this 2015 finish.